Last week LendingClub held their very first Investor Day in New York. I was lucky enough to be invited along with about 150 others to the Morgan Stanley offices in Times Square. We heard from most of the LendingClub executive team as they laid out their vision for LendingClub and the opportunity they see in front of them. While much was said over the more than three hours of presentations here is what I considered to be the three most interesting announcements from the day. This is a really big deal in my opinion and I was surprised it was not mentioned until the fourth presentation of the day when Patrick Dunne, their Chief Capital Officer, took the stage. LendingClub will be launching an Exchange Traded Partnership (ETP) that will be traded like a stock (similar to an ETF) on a public exchange but will be backed by LendingClub loans. It will be available to all investors and will be liquid. This could be a game changer as it will provide all investors with a simple and accessible way to get exposure to LendingClub loans. No timetable was given for its implementation and if it launches in 2018 it will likely be late in the year. One of the criticisms investors have had over the years is that when someone takes out a debt consolidation loan it is not clear whether they really pay off their credit cards or use the money for other purposes. LendingClub has been running a test for some time that pays off a borrower’s credit card balance directly to give some certainty over loan proceeds. LendingClub claims that this will help them increase origination volume by 5% as they will be able to approve more borrowers knowing that their credit card debt will be paid off. LendingClub announced a very handy new feature for those borrowers taking out an auto loan. A prospective borrower can simply take a photo of their registration and LendingClub will pre-populate fields eliminating almost all of the data entry. While this feature is not that groundbreaking it was interesting to me because it demonstrated that LendingClub is focused on developing the auto loan segment. The one-year returns for most of the major asset classes have been negative, but not p2p lending. This is kind of amazing. Every single major asset class has negative 1 year returns. It was accompanied by the below image, which shows tickers for all of the major asset classes including stocks, bonds, REITs, commodities and US TIPS. The returns of each of these for the year ending September 11th was negative. In the past five days the Dow Jones Industrial Average has slipped 10.36% and the past two days we have seen wild swings both up and down. The news of volatility in the stock market has been the leading story in most major news outlets. Many stocks took a large hit yesterday and recovered slightly throughout the day. Many investors panicked and sold their positions. Investors using TD Ameritrade experienced slowness due to historic volumes. Even Lending Club’s stock hit a 52 week low of 10.28 at market open yesterday, dropping around 11%. It now sits around $12. Time will tell whether this was just a small correction and this bull market will continue or if this is the start of a sustained slump. It is impossible to know where the market will go from here. The important thing to remember is that these market fluctuations are common when you are investing in stocks. Investing in marketplace lending has and will likely continue to produce far less volatile returns. The consistency of returns has long been reported as a benefit of investing in marketplace lending, but it isn’t until events like these that we actually come to appreciate the consistent returns. Since Peter Renton began reporting his returns in 2011, he has seen overall returns ranging from 8.12% to 12.44%. This performance should continue, despite whatever might be happening across the stock market, barring another recession or a spike in unemployment. This makes investing with companies like Lending Club or Prosper, a great diversifier. Investing in unsecured debt is an asset class that is uncorrelated to stocks. When Are State Securities Regulators Going to Get a Clue About P2P Lending? Today, Lending Club is available to investors in 26 states on their retail platform (they do allow investors in 17 more states to participate on their trading platform). Prosper is available in 30 states (plus Washington D.C.). This leaves a large section of the country out of luck when it comes to investing in p2p lending. What is going on? I understand there is a credit crunch and these platforms are providing an alternative. But there are limitations on the financial data that is available, and a chance of default, so we need to protect investors. This line of thinking is common among many state securities regulators. Now, Naylor did not elaborate exactly what he meant by “limitations on the financial data”. My calls to Naylor’s office have not been returned so one can only guess as to what he means here. In an interview on CNBC’s Squawk Box last Friday, Lending Club’s CEO Renaud Laplanche was asked about the above quote from Naylor. I completely agree with his response. Lending Club is very transparent, providing detailed information on every borrower and the entire loan history is available to download for analysis by investors. But I would have also added that well-diversified investors are not losing money. What Are Securities Regulators Protecting Investors From? With the stock market down almost 20% from its April high one has to wonder how this will impact peer to peer lending. While the down market is certainly not good news for anyone with money in equities, I am guessing the management at Lending Club and Prosper are quite happy with the latest stock market gyrations. Since the 2009 lows the stock market has steadily rallied and those who stayed the course have seen their portfolios grow significantly. But the crash of 2008-09 is still fresh in investors’ minds and many people who have come back into the market in recent months are likely questioning their decision to do that now. 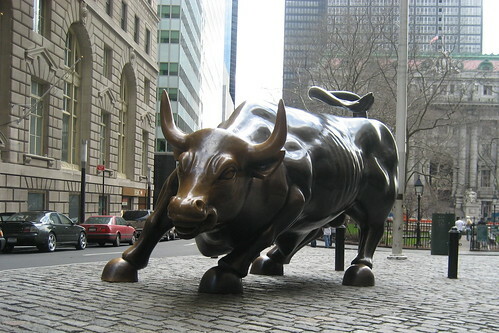 Is a Bull Market for Stocks Bad for P2P Lending? Today the Dow Jones Industrial Average was up another 200 points, continuing its almost constant move upwards over the last six months. It is up about 18.5% in the last six months alone, a pretty nice return. But this pales in comparison with the two year return. The Dow is up a staggering 87% since its low of 6,547 reached on March 9, 2009. You certainly will never get a return like that with peer to peer lending. Which brings me to the question, is a bull market for stocks bad for p2p lending?